I really want to see Carwin fight Cain. N00bs understand, its the new generation! Lesnar smashed Randy and Mir. JDS smashed a lot of people. "the new generation is here and the sport has evolved !" Lesnar v JDS cant ever happen. Theres a lot of people here, who dont know what Carwin can do. I want to see Cain v Carwin. I have done since Mir and Nog both got smashed. Make it happen Sherdog. Dumb fight, Carwin would get wrecked. I hope you aren't being serious. I really want to see a unicorn dancing on a rainbow and that isnt going to happen either. I actually am. Cain gets tagged a lot, and when Carwin tags people, there aint no round 2. Usually. Carwin has good wrestling and one of the most ridiculous chins in MMA history iirc. Would be a interesting fight but we don't know how all of his injuries have affected him, I want to see him comE back and fight (if barnett comes over it could be a good matchup) and see what he looks like. This is all true, but you left out the part about him being slow as molasses or burning through his gas tank faster than a blown Chevelle. am i the only one here that wants to see the two gorrillas go at it? let em bang bro. let em bang. If carwin ever does make a come back, his record aint bad. put it that way. in a lot of ways it should read - beat the hell out of everyone and then lost to jds. which is exactly what cain had going into his title fight. cain beat nog and lesnar. jds made his name on cro cop. carwin smashed lesnar and defeated himself. he also smashed mir and gonzaga. its not a bad record. Carwin isn't relevant, I don't think he will fight again. Carwin couldn't even stay healthy enough to fight Big country. i think his days are done. I agree, Carwin, when healthy, is a threat to anyone. When you can throw that hard, you'll always make your opponent think twice. Sure he's had horrible injuries and even when fit he has a bad gas tank, however that's what would make a fight against Cain so interesting, Carwin would have to pressure him for the first round and a half if he was to get anything, after that Cain would take over. His last fight was 2 years ago, His last win nearly 3. It wouldn't be an interesting fight at all. I wouldn't have minded seeing it a few years ago before Cain was champ. 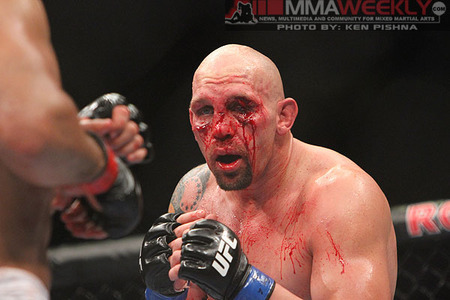 Carwin has done nothing the last few years, I'd be surprised if he even fights again. I'd like to see the fight, and like stated in the OP, aside from Lesnar/JDS, it's the one fight we didn't get to see from the "new generation" HWs (other than Duffee vs everyone as people thought he was part of that group early on). Obviously, it's not as appealing as it once was. Remember when they announced Cain vs. Carwin? That was going to be a badass fight at the time. Then they scrapped it and just gave Carwin a title shot instead. I always say that Carwin's injuries is one of the worst things to happen to the HW division, along with Brock getting sick, Nog's injuries, and exodus of Sylvia, Arlovski, and Werdum. The division would have been super stacked for a while with a lot of fun fights. he looked better than cain did, the first time they danced. im pretty sure lesnar, mir and gonzaga were top heavy weights too. by your logic, jds might as well just retire.